Journal of a Family System Administrator: Did the power outage trigger my disk to fail? Did the power outage trigger my disk to fail? On another machine, I run Prometheus to collect, store, and analyze my measurements. For more details about Prometheus, you might want to review the "Prometheus: A practical guide to alerting at scale" presentation and slides. When I awoke on Friday the 27th, I noticed the electric power must have went out during the night because the clock on the microwave was flashing. The NAS didn't reboot because I use a UPS. That is when I noticed a hard disk failed and now needs to be replaced. I replaced the drive two days later. But I wondered -- did the power event cause the drive to fail? The answer turned out to be no -- but I thought it would be useful to capture the data I used to make this conclusion. When did the drive fail? 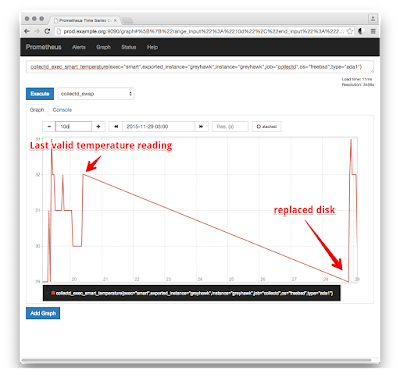 I use smartctl to measure the temperature of my hard disks. I noticed that the temperature of one of my disks was missing. This measurement helped me determine when the drive failed. When did the power event happen? I poll the status of the UPS every 10 seconds. 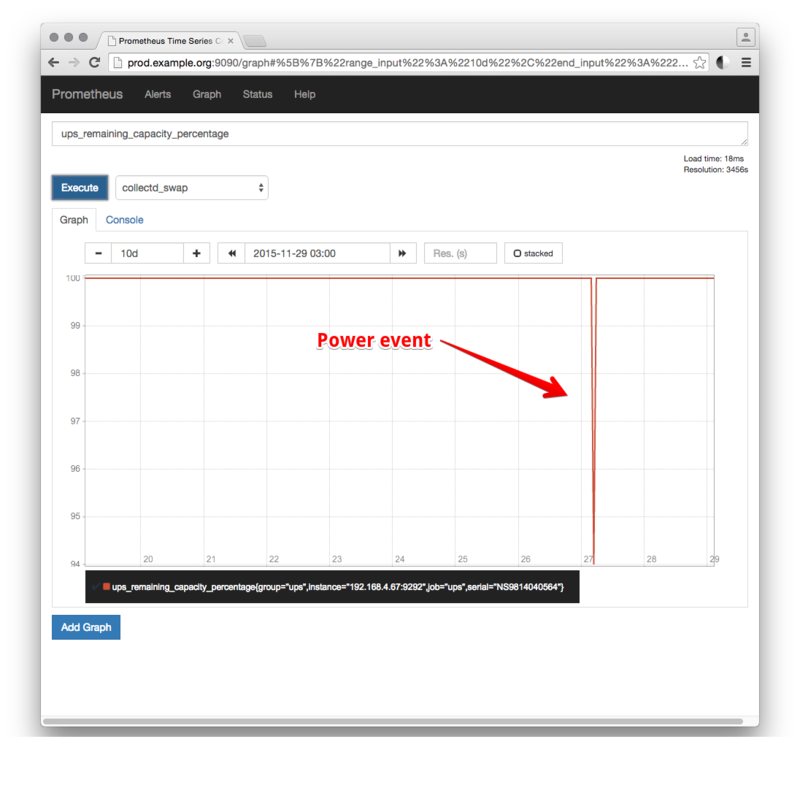 The power event had to be shorter than 10 seconds, because the monitoring never even noticed this event -- the UPS status was always "on mains". I found a spike in the UPS remaining capacity measurement -- that is the only clue I had about when the power event happened. 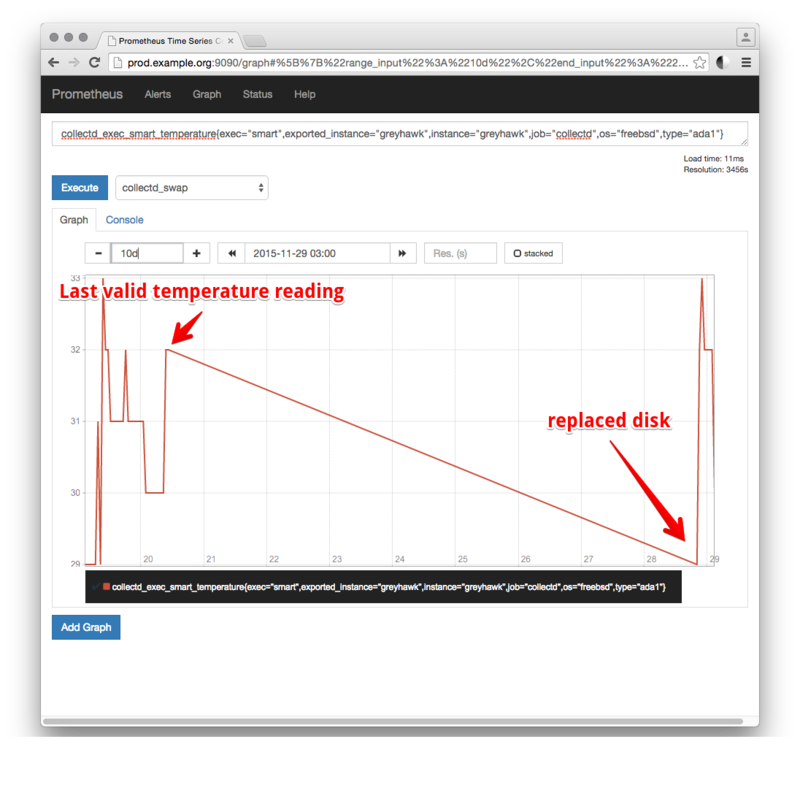 Comparing these two graphs showed that the disk failed about a week before the power event. 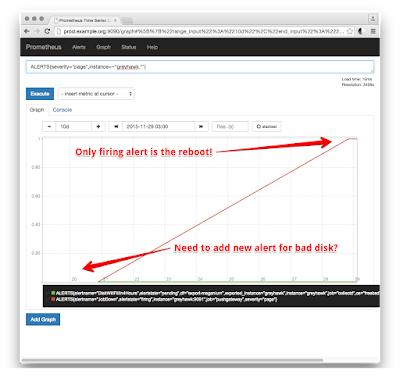 Prometheus stores pending/firing alerts in the time series database. I wanted to know if there were any firing alerts that I missed -- did I miss an alert for a week about my bad disk? Nope -- the only firing alert was when I rebooted the NAS. I will need to add another alert for failing disks. The FreeBSDism of using 'sysctl -n kern.disks' to find a list of disks in a machine appears to quietly drop failed or missing hard disks -- this is a feature for removable USB drives. I cannot use this measurement to track the disks expected to be alive on a machine. Polling the UPS might not give the required data for very short power events. I might want to enable SNMP traps to capture very short power events. I don't want to leave my raid array with one dead disk for a whole week. I am going to setup some alerts for this!